In the opening verses of Revelation 14, the glorious state of the people of God after their redemption is portrayed. They have endured the ravages of the great test brought to bear upon them by the setting up of the image of the beast which we will explore more fully in Lesson 15. Actually the prophecy portrayed in Revelation 13 ends in Chapter 14:1-5. Revelation 14:6 begins a new line of prophecy which gives the last warning ever to be given to this world. “And I saw another angel fly in the midst of heaven, having the everlasting gospel to preach unto them that dwell on the earth, and to every nation, and kindred, and tongue, and people, Saying with a loud voice, Fear God, and give glory to Him; for the hour of His judgement is come: and worship Him that made heaven, and earth, and the sea, and the fountains of waters.” Revelation 14:6,7. This message is both old and new. It is a universal message, for “every nation, and kindred, and tongue, and people” is addressed. This message warns of and is to prepare the earth for God’s final judgement. It must be preached before the end of the world. “And this gospel of the kingdom shall be preached in all the world for a witness unto all nations; and then shall the end come.” Matthew 24:14. The first angel’s message is not entirely new, for it is called the everlasting gospel, or good news. This good news was first given to man in the Garden of Eden (see Genesis 3:15): By the sacrifice of the Son of God, man can come back into harmony with his Creator. How sad it is that this blessed truth has so many times been lost sight of! Man has replaced it with every possible false doctrine, including trying to gain righteousness through his own good works of trying to overthrow God’s law of Ten Commandments. Besides this everlasting gospel, the first angel brings to view a new subject. “…The hour of His judgement is come: and worship Him that made heaven, and earth, and the sea, and the fountains of waters.” As covered in Lesson 11, the judgment in the heavenly sanctuary began in 1844 when Christ entered the Most Holy Place. This message that “the hour of His judgement is come” could not be preached until that time. Every event in the plan of God occurs according to His timetable. And before God allows any portion of that plan to take place, He sends men a warning. God often has a special truth for a special time. “Surely the Lord God will do nothing, but He revealeth His secret unto His servants the prophets.” Amos 3:7. Think of Noah; he was given a special message to prepare and warn his contemporaries of the coming flood. See 2 Peter 2:5. Jonah received a special message to give to the people of Nineveh to bring them to repentance. See Jonah 1:1-3. And a special messenger, John the Baptist, was sent to prepare the people for Christ’s first advent. See Matthew 3:1-4. Each of these messengers had a special message for a special time, which was to that time period “resent truth”. Likewise, before the great judgment began in heaven, the message went forth, “The hour of His judgement is come.” In 1818, after two years of diligent study, an American by the name of William Miller became convinced as he studied the prophecies of Daniel 8 and 9 that the end of all things was at hand, yet for nine years he kept these thoughts to himself. In 1831, he gave his first public lecture, declaring his reasons for believing that Christ’s coming was imminent. Two years later, his teachings were reinforced by one of the signs Jesus foretold would take place before His coming – the great meteoric shower of November 18, 1833. Shortly after William Miller began preaching this message in America, Joseph Wolff began preaching it actively in Africa, the Middle East, India, and also in the United States. Soon this message was taken up by others throughout the world, and from everywhere the cry went up, “The hour of His judgement is come!” This message called men to the realization that God, before whom they must stand in judgment, was not just a power in nature, such as the theory of pantheism claimed, or non-existent, as the theory of evolution implied. See 2 Peter 3:3, 4. As this message was preached, most of the nominal Christian churches rejected the message of “the hour of His judgment is come” and began to ridicule and persecute those who did believe it. When this took place, God brought a new movement, preaching an additional message, into being. “And there followed another angel, saying, Babylon is fallen, is fallen, that great city, because she made all nations drink of the wine of the wrath of her fornication.” Revelation 14:8. The Babylon referred to here can be none other than that great pagan-Christian power of the papacy. See also Revelation 17:2-6. Verse 5 calls her the “mother of harlots”, indicating that she has children. These are those churches which, even though they call themselves Protestants, nevertheless follow in Rome’s footsteps by teaching false doctrines, uniting with worldly governments to enforce their dogmas, and persecuting God’s true people. The Protestant churches, though at one time the people of God, have become fallen churches by refusing to accept the Heaven-sent light of the first angel’s message. In the summer of 1844, approximately 50,000 people in the United States became a part of this movement of the second angel by withdrawing from the apostate churches, making up what became known as the Advent Movement. It was generally taught by the religious leaders of that day that this earth was the sanctuary. William Miller therefore, taught that the cleansing of the sanctuary spoken of in Daniel 8:14 must refer to the second coming of Christ to this earth and its purification by fire. Accordingly it was preached that in 1844 Christ would come. With the passing of the time, the Advent believers suffered grievous disappointment. The great majority gave up their faith entirely. But a handful, realizing the Lord’s guidance in their experience, studied more deeply and in so doing discovered the important doctrine of Christ’s ministry in the heavenly sanctuary. They then arrived at the realization that the work of cleansing the sanctuary was to take place in heaven, not on this earth. 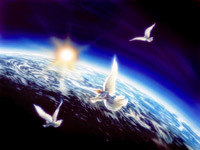 In addition, they saw that one more message still had to be preached to the world- the third angel’s message. The message of the third angel is the most startling denunciation of false worship. It is also the most severe threat of divine punishment found in the entire Bible. “And the third angel followed them, saying with a loud voice, If any man worship the beast and his image, and receive his mark in his forehead, or in his hand, The same shall drink of the wine of the wrath of God, which is poured out without mixture into the cup of His indignation; and he shall be tormented with fire and brimstone in the presence of the holy angels, and in the presence of the Lamb: And the smoke of their torment ascendeth up for ever and ever: and they have no rest day nor night, who worship the beast and his image, and whosoever receiveth the mark of his name.” Revelation 14:9-11. This message calls all mankind to take sides in the conflict between God’s law and that of the antichrist, Rome. (This will be studied more extensively in Lesson 15.) It will forever separate the righteous and the wicked- the saints to receive the glory described in Revelation 15:2, 3, and the wicked to receive the wrath of God without mercy as described in Revelation 16. 1. Against worshipping the beast of Revelation 13. In Lesson 15 this beast will be more closely identified; but, as we already studied regarding the little horn of Daniel 7, this antichristian power is the papacy. 2. Against worshipping the image of the beast. This image consists of apostate Protestantism, which adopts the false doctrines of the papacy and its use of civil law to force its views. Most Protestants would not think of worshipping the pope of Rome, yet at the same time they adhere to an institution which the Catholic hierarchy originated, that of observing the first day of the week as the Sabbath instead of the seventh day, which God blessed and sanctified at creation. 3. Against receiving the mark of the beast- the observance of Sunday which will be enforced by the apostate churches working in union with the state through civil law. 4. Of the wrath of God to be poured out on those who accept the mark of the beast. This angel cries “mightily with a strong voice,” and an additional voice joins in: “Come out of her, My people.” God requires His people to separate themselves from all apostate organizations and practices. When this takes place, the prophecy of Joel 2:23 will be completed. “Be glad then, ye children of Zion, and rejoice in the Lord your God: for He will cause to come down for you the rain, the former rain, and the latter rain in the first month.” These great calls will prepare a people to stand true to God in the final days of this earth’s history. Will you be among them? That are the characteristics of God’s true church of the last days? 1. It proclaims the message of the judgement world-wide, urging the worship of the Creator. Revelation 14:6, 7. 1. Are the messages given in Revelation 14 entirely new? 2. What is the new message given to the world by the first angel of Revelation 14? 3. Could this message have properly been given at any time other than in 1844? 4. How does God reveal His plans to mankind? 5. What was one of the physical signs which helped draw people’s attention to the fact that Christ’s coming was near? 6. Did this message cause people to worship the living God? 7. Did most people accept this heaven-sent message? 8. Due to the rejection of this message by the Protestant churches, what message was now proclaimed? 9. True or false? The message of the third angel is a message of peace and prosperity. 10. In the religious crisis portrayed by the third angel, will it be possible to remain neutral? 11. What four dangers does the third angel warn against? 12. Does God leave anyone in darkness regarding the dangers involved? 13. Will God have faithful people in these last days? 14. Name three of their characteristics.